For other uses, see Plasma. Plasma (from Ancient Greek πλάσμα​, meaning 'moldable substance') is one of the four fundamental states of matter, and was first described by chemist Irving Langmuir in the 1920s. Plasma can be artificially generated by heating or subjecting a neutral gas to a strong electromagnetic field to the point where an ionized gaseous substance becomes increasingly electrically conductive, and long-range electromagnetic fields dominate the behaviour of the matter. Top: Lightning and neon lights are commonplace generators of plasma. Bottom left: A plasma globe, illustrating some of the more complex plasma phenomena, including filamentation. Bottom right: A plasma trail from the Space Shuttle Atlantis during re-entry into Earth's atmosphere, as seen from the International Space Station. Plasma and ionized gases have properties and display behaviours unlike those of the other states, and the transition between them is mostly a matter of nomenclature and subject to interpretation. Based on the surrounding environmental temperature and density, partially ionized or fully ionized forms of plasma may be produced. Neon signs and lightning are examples of partially ionized plasma. The Earth's ionosphere is a plasma and the magnetosphere contains plasma in the Earth's surrounding space environment. The interior of the Sun is an example of fully ionized plasma, along with the solar corona and stars. Positive charges in ions are achieved by stripping away electrons orbiting the atomic nuclei, where the total number of electrons removed is related to either increasing temperature or the local density of other ionized matter. This also can be accompanied by the dissociation of molecular bonds, though this process is distinctly different from chemical processes of ion interactions in liquids or the behaviour of shared ions in metals. The response of plasma to electromagnetic fields is used in many modern technological devices, such as plasma televisions or plasma etching. The word plasma comes from Ancient Greek πλάσμα​, meaning 'moldable substance' or 'jelly', and describes the behaviour of the ionized atomic nuclei and the electrons within the surrounding region of the plasma. Very simply, each of these nuclei are suspended in a movable sea of electrons. Plasma was first identified in a Crookes tube, and so described by Sir William Crookes in 1879 (he called it "radiant matter"). The nature of this "cathode ray" matter was subsequently identified by British physicist Sir J.J. Thomson in 1897. The term "plasma" was coined by Irving Langmuir in 1928. Lewi Tonks and Harold Mott-Smith, both of whom worked with Irving Langmuir in the 1920s, recall that Langmuir first used the word "plasma" in analogy with blood. Mott-Smith recalls, in particular, that the transport of electrons from thermionic filaments reminded Langmuir of "the way blood plasma carries red and white corpuscles and germs." Plasma is a state of matter in which an ionized gaseous substance becomes highly electrically conductive to the point that long-range electric and magnetic fields dominate the behaviour of the matter. The plasma state can be contrasted with the other states: solid, liquid, and gas. The plasma approximation: The plasma approximation applies when the plasma parameter, Λ, representing the number of charge carriers within a sphere (called the Debye sphere whose radius is the Debye screening length) surrounding a given charged particle, is sufficiently high as to shield the electrostatic influence of the particle outside of the sphere. Plasma temperature is commonly measured in kelvin or electronvolts and is, informally, a measure of the thermal kinetic energy per particle. High temperatures are usually needed to sustain ionisation, which is a defining feature of a plasma. The degree of plasma ionisation is determined by the electron temperature relative to the ionization energy (and more weakly by the density), in a relationship called the Saha equation. At low temperatures, ions and electrons tend to recombine into bound states—atoms—and the plasma will eventually become a gas. In most cases the electrons are close enough to thermal equilibrium that their temperature is relatively well-defined; this is true even when there is a significant deviation from a Maxwellian energy distribution function, for example, due to UV radiation, energetic particles, or strong electric fields. Because of the large difference in mass, the electrons come to thermodynamic equilibrium amongst themselves much faster than they come into equilibrium with the ions or neutral atoms. For this reason, the ion temperature may be very different from (usually lower than) the electron temperature. This is especially common in weakly ionized technological plasmas, where the ions are often near the ambient temperature. is the number density of electrons. is the limit separating a plasma from being partially or fully ionized. , which can correspond to a degree of ionization as low as 0.01%. Most of "technological" (engineered) plasmas are weakly ionized gases. Based on the relative temperatures of the electrons, ions and neutrals, plasmas are classified as "thermal" or "non-thermal" (also referred to as "cold plasmas"). ). A kind of common nonthermal plasma is the mercury-vapor gas within a fluorescent lamp, where the "electrons gas" reaches a temperature of 10,000 kelvins while the rest of the gas stays barely above room temperature, so the bulb can even be touched with hands while operating. A particular and unusual case of "inverse" nonthermal plasma is the very high temperature plasma produced by the Z machine, where ions are much hotter than electrons. Lightning as an example of plasma present at Earth's surface: Typically, lightning discharges 30 kiloamperes at up to 100 megavolts, and emits radio waves, light, X- and even gamma rays. Plasma temperatures can approach 30000 K and electron densities may exceed 1024 m−3. ), but on the scale of the Debye length there can be charge imbalance. In the special case that double layers are formed, the charge separation can extend some tens of Debye lengths. It is possible to produce a plasma that is not quasineutral. An electron beam, for example, has only negative charges. The density of a non-neutral plasma must generally be very low, or it must be very small, otherwise, it will be dissipated by the repulsive electrostatic force. In astrophysical plasmas, Debye screening prevents electric fields from directly affecting the plasma over large distances, i.e., greater than the Debye length. However, the existence of charged particles causes the plasma to generate, and be affected by, magnetic fields. 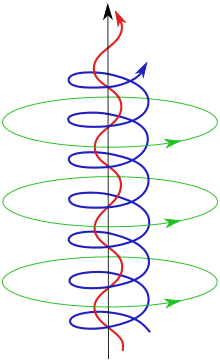 This can and does cause extremely complex behaviour, such as the generation of plasma double layers, an object that separates charge over a few tens of Debye lengths. The dynamics of plasmas interacting with external and self-generated magnetic fields are studied in the academic discipline of magnetohydrodynamics. is the magnetic field), and is not affected by Debye shielding. Plasmas are by far the most common phase of ordinary matter in the universe, both by mass and by volume. Above the Earth's surface, the ionosphere is a plasma, and the magnetosphere contains plasma. Within our Solar System, interplanetary space is filled with the plasma expelled via the solar wind, extending from the Sun's surface out to the heliopause. Furthermore, all the distant stars, and much of interstellar space or intergalactic space is also likely filled with plasma, albeit at very low densities. Astrophysical plasmas are also observed in Accretion disks around stars or compact objects like white dwarfs, neutron stars, or black holes in close binary star systems. Plasma is associated with ejection of material in astrophysical jets, which have been observed with accreting black holes or in active galaxies like M87's jet that possibly extends out to 5,000 light-years. Those found in plasma displays, including TV screens. Impermeable plasma is a type of thermal plasma which acts like an impermeable solid with respect to gas or cold plasma and can be physically pushed. Interaction of cold gas and thermal plasma was briefly studied by a group led by Hannes Alfvén in 1960s and 1970s for its possible applications in insulation of fusion plasma from the reactor walls. However, later it was found that the external magnetic fields in this configuration could induce kink instabilities in the plasma and subsequently lead to an unexpectedly high heat loss to the walls. In 2013, a group of materials scientists reported that they have successfully generated stable impermeable plasma with no magnetic confinement using only an ultrahigh-pressure blanket of cold gas. While spectroscopic data on the characteristics of plasma were claimed to be difficult to obtain due to the high pressure, the passive effect of plasma on synthesis of different nanostructures clearly suggested the effective confinement. They also showed that upon maintaining the impermeability for a few tens of seconds, screening of ions at the plasma-gas interface could give rise to a strong secondary mode of heating (known as viscous heating) leading to different kinetics of reactions and formation of complex nanomaterials. Just like the many uses of plasma, there are several means for its generation, however, one principle is common to all of them: there must be energy input to produce and sustain it. For this case, plasma is generated when an electric current is applied across a dielectric gas or fluid (an electrically non-conducting material) as can be seen in the adjacent image, which shows a discharge tube as a simple example (DC used for simplicity). The potential difference and subsequent electric field pull the bound electrons (negative) toward the anode (positive electrode) while the cathode (negative electrode) pulls the nucleus. As the voltage increases, the current stresses the material (by electric polarization) beyond its dielectric limit (termed strength) into a stage of electrical breakdown, marked by an electric spark, where the material transforms from being an insulator into a conductor (as it becomes increasingly ionized). The underlying process is the Townsend avalanche, where collisions between electrons and neutral gas atoms create more ions and electrons (as can be seen in the figure on the right). The first impact of an electron on an atom results in one ion and two electrons. Therefore, the number of charged particles increases rapidly (in the millions) only "after about 20 successive sets of collisions", mainly due to a small mean free path (average distance travelled between collisions). 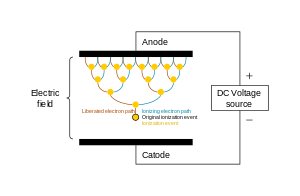 Cascade process of ionisation. Electrons are "e−", neutral atoms "o", and cations "+". Because of their sizable temperature and density ranges, plasmas find applications in many fields of research, technology and industry. For example, in: industrial and extractive metallurgy, surface treatments such as plasma spraying (coating), etching in microelectronics, metal cutting and welding; as well as in everyday vehicle exhaust cleanup and fluorescent/luminescent lamps, fuel ignition, while even playing a part in supersonic combustion engines for aerospace engineering. Cascaded Arc Plasma Source: a device to produce low temperature (≈1eV) high density plasmas (HDP). Inductively coupled plasma (ICP): similar to a CCP and with similar applications but the electrode consists of a coil wrapped around the chamber where plasma is formed. Wave heated plasma: similar to CCP and ICP in that it is typically RF (or microwave). Examples include helicon discharge and electron cyclotron resonance (ECR). Arc discharge: this is a high power thermal discharge of very high temperature (≈10,000 K). It can be generated using various power supplies. It is commonly used in metallurgical processes. For example, it is used to smelt minerals containing Al2O3 to produce aluminium. Dielectric barrier discharge (DBD): this is a non-thermal discharge generated by the application of high voltages across small gaps wherein a non-conducting coating prevents the transition of the plasma discharge into an arc. It is often mislabeled 'Corona' discharge in industry and has similar application to corona discharges. It is also widely used in the web treatment of fabrics. The application of the discharge to synthetic fabrics and plastics functionalizes the surface and allows for paints, glues and similar materials to adhere. The dielectric barrier discharge was used in the mid-1990s to show that low temperature atmospheric pressure plasma is effective in inactivating bacterial cells. This work and later experiments using mammalian cells led to the establishment of a new field of research known as plasma medicine. The dielectric barrier discharge configuration was also used in the design of low temperature plasma jets. These plasma jets are produced by fast propagating guided ionisation waves known as plasma bullets. "Piezoelectric direct discharge plasma:" is a nonthermal plasma generated at the high-side of a piezoelectric transformer (PT). This generation variant is particularly suited for high efficient and compact devices where a separate high voltage power supply is not desired. A world effort was triggered in the 1960s to study magnetohydrodynamic converters in order to bring MHD power conversion to market with commercial power plants of a new kind, converting the kinetic energy of a high velocity plasma into electricity with no moving parts at a high efficiency. Research was also conducted in the field of supersonic and hypersonic aerodynamics to study plasma interaction with magnetic fields to eventually achieve passive and even active flow control around vehicles or projectiles, in order to soften and mitigate shock waves, lower thermal transfer and reduce drag. Such ionized gases used in "plasma technology" ("technological" or "engineered" plasmas) are usually weakly ionized gases in the sense that only a tiny fraction of the gas molecules are ionized. These kinds of weakly ionized gases are also nonthermal "cold" plasmas. In the presence of magnetics fields, the study of such magnetized nonthermal weakly ionized gases involves resistive magnetohydrodynamics with low magnetic Reynolds number, a challenging field of plasma physics where calculations require dyadic tensors in a 7-dimensional phase space. When used in combination with a high Hall parameter, a critical value triggers the problematic electrothermal instability which limited these technological developments. Nonthermal plasma or "cold plasma"
Plasma arc waste disposal, recycling. Research indicates that magnetic fields created by plasma during a thunderstorm can induce hallucination in the human mind. A declassified Ministry of Defense report states that it is "medically proven" that magnetic fields related to plasma cause hallucinations and that "the close proximity of plasma-related fields can adversely affect a vehicle or person". The report also indicated that scientists in the former Soviet Union are pursuing related technology for military purposes. ^ The material undergoes various "regimes" or stages (e.g. saturation, breakdown, glow, transition and thermal arc) as the voltage is increased under the voltage-current relationship. The voltage rises to its maximum value in the saturation stage, and thereafter it undergoes fluctuations of the various stages; while the current progressively increases throughout. ^ Across literature, there appears to be no strict definition on where the boundary is between a gas and plasma. Nevertheless, it is enough to say that at 2,000°C the gas molecules become atomized, and ionized at 3,000 °C and "in this state, [the] gas has a liquid like viscosity at atmospheric pressure and the free electric charges confer relatively high electrical conductivities that can approach those of metals." ^ Note that non-thermal, or non-equilibrium plasmas are not as ionized and have lower energy densities, and thus the temperature is not dispersed evenly among the particles, where some heavy ones remain "cold". ^ a b c Goldston, R.J.; Rutherford, P.H. (1995). Introduction to Plasma Physics. Taylor & Francis. p. 1−2. ISBN 978-0-7503-0183-1. ^ Morozov, A.I. (2012). Introduction to Plasma Dynamics. CRC Press. p. 17. ISBN 978-1-4398-8132-3. ^ Morozov, A.I. (2012). Introduction to Plasma Dynamics. CRC Press. p. 30. ISBN 978-1-4398-8132-3. ^ Morozov, A.I. (2012). Introduction to Plasma Dynamics. CRC Press. p. 4−5. ISBN 978-1-4398-8132-3. ^ "How Lightning Works". HowStuffWorks. Archived from the original on 7 April 2014. ^ Phillips, K. J. H. (1995). Guide to the Sun. Cambridge University Press. p. 295. ISBN 978-0-521-39788-9. Archived from the original on 15 January 2018. ^ Aschwanden, M. J. (2004). Physics of the Solar Corona. An Introduction. Praxis Publishing. ISBN 978-3-540-22321-4. ^ Piel, A. (2010). Plasma Physics: An Introduction to Laboratory, Space, and Fusion Plasmas. Springer. pp. 4–5. ISBN 978-3-642-10491-6. Archived from the original on 5 January 2016. ^ a b Sturrock, Peter A. (1994). Plasma Physics: An Introduction to the Theory of Astrophysical, Geophysical & Laboratory Plasmas. Cambridge University Press. ISBN 978-0-521-44810-9. ^ Chu, P.K. ; Lu, XinPel (2013). Low Temperature Plasma Technology: Methods and Applications. CRC Press. ISBN 978-1-4665-0990-0. ^ Chu, P.K. ; Lu, XinPel (2013). Low Temperature Plasma Technology: Methods and Applications. CRC Press. p. 3. ISBN 978-1-4665-0990-0. ^ Chiuderi, C.; Velli, M. (2015). Basics of Plasma Astrophysics. Springer. p. 17. ISBN 978-88-470-5280-2. ^ Announced in his evening lecture to the Royal Institution on Friday, 30 April 1897, and published in Thomson, J. J. (1897). "J. J. Thomson (1856–1940)". Philosophical Magazine. 44 (269): 293–316. doi:10.1080/14786449708621070. Archived from the original on 12 August 2015. ^ a b Langmuir, I. (1928). "Oscillations in Ionized Gases". Proceedings of the National Academy of Sciences. 14 (8): 627–637. Bibcode:1928PNAS...14..627L. doi:10.1073/pnas.14.8.627. PMC 1085653. PMID 16587379. Archived from the original on 7 July 2017. ^ a b Chen, Francis F. (1984). Introduction to Plasma Physics and controlled fusion. Springer International Publishing. pp. 2–3. ISBN 9781475755954. Archived from the original on 15 January 2018. ^ a b Freidberg, Jeffrey P. (2008). Plasma Physics and Fusion Energy. Cambridge University Press. p. 121. ISBN 9781139462150. Archived from the original on 24 December 2016. ^ Hazeltine, R.D. ; Waelbroeck, F.L. (2004). The Framework of Plasma Physics. Westview Press. ISBN 978-0-7382-0047-7. ^ Dendy, R. O. (1990). Plasma Dynamics. Oxford University Press. ISBN 978-0-19-852041-2. Archived from the original on 15 January 2018. ^ Hastings, Daniel & Garrett, Henry (2000). Spacecraft-Environment Interactions. Cambridge University Press. ISBN 978-0-521-47128-2. ^ 1929-, Chen, Francis F. (1984). Introduction to plasma physics and controlled fusion. Chen, Francis F., 1929- (2nd ed.). New York: Plenum Press. ISBN 978-0306413322. OCLC 9852700. Archived from the original on 15 January 2018. ^ "Quasi-neutrality - The Plasma Universe theory (Wikipedia-like Encyclopedia)". www.plasma-universe.com. Archived from the original on 26 October 2017. Retrieved 25 October 2017. ^ Merlino, Robert L. (3 October 2012). "Plasma Oscillations— An application of electrostatics and classical mechanics". homepage.physics.uiowa.edu. pp. See October 3 notes. Archived from the original on 26 October 2017. Retrieved 25 October 2017. ^ Nicholson, Dwight R. (1983). Introduction to Plasma Theory. John Wiley & Sons. ISBN 978-0-471-09045-8. ^ Chapman, Brian (25 September 1980). "Chapter 3: Plasmas". Glow Discharge Processes: Sputtering and Plasma Etching. New York: John Wiley & Sons. p. 49. ISBN 978-0471078289. ^ Haines, M. G.; LePell, P. D.; Coverdale, C. A.; Jones, B.; Deeney, C.; Apruzese, J. P. (23 February 2006). "Ion Viscous Heating in a Magnetohydrodynamically Unstable Pinch at Over 2 × 109 Kelvin" (PDF). Physical Review Letters. 96 (7): 075003. Bibcode:2006PhRvL..96g5003H. doi:10.1103/PhysRevLett.96.075003. PMID 16606100. ^ Petit, J.-P. "The Z Machine: Over two billion degrees! Malcolm Haines' paper" (PDF). Retrieved 2018-04-07. ^ Plasma science : from fundamental research to technological applications. National Research Council (U.S.). Panel on Opportunities in Plasma Science and Technology. Washington, D.C.: National Academy Press. 1995. p. 51. ISBN 9780309052313. OCLC 42854229. ^ Dorch, Søren (13 April 2007). "Magnetohydrodynamics". Scholarpedia. 2 (4): 2295. Bibcode:2007SchpJ...2.2295D. doi:10.4249/scholarpedia.2295. ISSN 1941-6016. Archived from the original on 2 April 2008. ^ Frank-Kamenetskii, David A. (1972) [1961–1963]. Plasma-The Fourth State of Matter (3rd ed.). New York: Plenum Press. ISBN 9781468418965. Archived from the original on 15 January 2018. ^ Bittencourt, J.A. (2004). Fundamentals of Plasma Physics. Springer. p. 1. ISBN 9780387209753. Archived from the original on 2 February 2017. ^ Hong, Alice (2000). Elert, Glenn, ed. "Dielectric Strength of Air". The Physics Factbook. Retrieved 2018-07-06. ^ It is assumed that more than 99% the visible universe is made of some form of plasma. Gurnett, D. A. & Bhattacharjee, A. (2005). Introduction to Plasma Physics: With Space and Laboratory Applications. Cambridge, UK: Cambridge University Press. p. 2. ISBN 978-0-521-36483-6. Scherer, K; Fichtner, H & Heber, B (2005). Space Weather: The Physics Behind a Slogan. Berlin: Springer. p. 138. ISBN 978-3-540-22907-0. .
^ Kelley, M. C. (2009). The Earth's Ionosphere: Plasma Physics and Electrodynamics (2nd ed.). Academic Press. ISBN 9780120884254. ^ Mészáros, Péter (2010) The High Energy Universe: Ultra-High Energy Events in Astrophysics and Cosmology, Publisher: Cambridge University Press, ISBN 978-0-521-51700-3, p. 99 Archived 2 February 2017 at the Wayback Machine. ^ IPPEX Glossary of Fusion Terms Archived 8 March 2008 at the Wayback Machine. Ippex.pppl.gov. Retrieved on 2011-11-19. ^ Dickel, J. R. (1990). "The Filaments in Supernova Remnants: Sheets, Strings, Ribbons, or?". Bulletin of the American Astronomical Society. 22: 832. Bibcode:1990BAAS...22..832D. ^ Grydeland, T. (2003). "Interferometric observations of filamentary structures associated with plasma instability in the auroral ionosphere". Geophysical Research Letters. 30 (6): 1338. Bibcode:2003GeoRL..30.1338G. doi:10.1029/2002GL016362. ^ Moss, G. D.; Pasko, V. P.; Liu, N.; Veronis, G. (2006). "Monte Carlo model for analysis of thermal runaway electrons in streamer tips in transient luminous events and streamer zones of lightning leaders". Journal of Geophysical Research. 111 (A2): A02307. Bibcode:2006JGRA..111.2307M. doi:10.1029/2005JA011350. ^ Doherty, Lowell R.; Menzel, Donald H. (1965). "Filamentary Structure in Solar Prominences". The Astrophysical Journal. 141: 251. Bibcode:1965ApJ...141..251D. doi:10.1086/148107. ^ Zhang, Y. A.; Song, M. T.; Ji, H. S. (2002). "A rope-shaped solar filament and a IIIb flare". Chinese Astronomy and Astrophysics. 26 (4): 442–450. Bibcode:2002ChA&A..26..442Z. doi:10.1016/S0275-1062(02)00095-4. ^ Boeuf, J. P.; Chaudhury, B.; Zhu, G. Q. (2010). "Theory and Modeling of Self-Organization and Propagation of Filamentary Plasma Arrays in Microwave Breakdown at Atmospheric Pressure". Physical Review Letters. 104 (1): 015002. Bibcode:2010PhRvL.104a5002B. doi:10.1103/PhysRevLett.104.015002. PMID 20366367. ^ Chin, S. L. (2006). Some Fundamental Concepts of Femtosecond Laser Filamentation (PDF). Journal of the Korean Physical Society. Springer Series in Chemical Physics. 49. p. 281. Bibcode:2008pui3.book..243C. doi:10.1007/978-3-540-73794-0_12. ISBN 978-3-540-73793-3. ^ Talebpour, A.; Abdel-Fattah, M.; Chin, S. L. (2000). "Focusing limits of intense ultrafast laser pulses in a high pressure gas: Road to new spectroscopic source". Optics Communications. 183 (5–6): 479–484. Bibcode:2000OptCo.183..479T. doi:10.1016/S0030-4018(00)00903-2. ^ Greaves, R. G.; Tinkle, M. D.; Surko, C. M. (1994). "Creation and uses of positron plasmas". Physics of Plasmas. 1 (5): 1439. Bibcode:1994PhPl....1.1439G. doi:10.1063/1.870693. ^ Morfill, G. E.; Ivlev, Alexei V. (2009). "Complex plasmas: An interdisciplinary research field". Reviews of Modern Physics. 81 (4): 1353–1404. Bibcode:2009RvMP...81.1353M. doi:10.1103/RevModPhys.81.1353. ^ Alfvén, H.; Smårs, E. (1960). "Gas-Insulation of a Hot Plasma". Nature. 188 (4753): 801–802. Bibcode:1960Natur.188..801A. doi:10.1038/188801a0. ^ Braams, C.M. (1966). "Stability of Plasma Confined by a Cold-Gas Blanket". Physical Review Letters. 17 (9): 470–471. Bibcode:1966PhRvL..17..470B. doi:10.1103/PhysRevLett.17.470. ^ Yaghoubi, A.; Mélinon, P. (2013). "Tunable synthesis and in situ growth of silicon-carbon mesostructures using impermeable plasma". Scientific Reports. 3: 1083. Bibcode:2013NatSR...3E1083Y. doi:10.1038/srep01083. PMC 3547321. PMID 23330064. ^ a b Hippler, R.; Kersten, H.; Schmidt, M.; Schoenbach, K.M., eds. (2008). "Plasma Sources". Low Temperature Plasmas: Fundamentals, Technologies, and Techniques (2nd ed.). Wiley-VCH. ISBN 978-3-527-40673-9. ^ Chen, Francis F. (1984). Plasma Physics and Controlled Fusion. Plenum Press. ISBN 978-0-306-41332-2. Archived from the original on 15 January 2018. ^ a b Leal-Quirós, Edbertho (2004). "Plasma Processing of Municipal Solid Waste". Brazilian Journal of Physics. 34 (4B): 1587–1593. Bibcode:2004BrJPh..34.1587L. doi:10.1590/S0103-97332004000800015. ^ a b c Gomez, E.; Rani, D. A.; Cheeseman, C. R.; Deegan, D.; Wise, M.; Boccaccini, A. R. (2009). "Thermal plasma technology for the treatment of wastes: A critical review". Journal of Hazardous Materials. 161 (2–3): 614–626. doi:10.1016/j.jhazmat.2008.04.017. PMID 18499345. ^ Szałatkiewicz, J. (2016). "Metals Recovery from Artificial Ore in Case of Printed Circuit Boards, Using Plasmatron Plasma Reactor". Materials. 9 (8): 683–696. Bibcode:2016Mate....9..683S. doi:10.3390/ma9080683. PMC 5512349. PMID 28773804. ^ National Research Council (1991). Plasma Processing of Materials : Scientific Opportunities and Technological Challenges. National Academies Press. ISBN 978-0-309-04597-1. ^ Nemchinsky, V. A.; Severance, W. S. (2006). "What we know and what we do not know about plasma arc cutting". Journal of Physics D: Applied Physics. 39 (22): R423. Bibcode:2006JPhD...39R.423N. doi:10.1088/0022-3727/39/22/R01. ^ Peretich, M.A. ; O'Brien, W.F. ; Schetz, J.A. (2007). "Plasma torch power control for scramjet application" (PDF). Virginia Space Grant Consortium. Archived (PDF) from the original on 29 June 2010. Retrieved 12 April 2010. ^ Stern, David P. "The Fluorescent Lamp: A plasma you can use". Archived from the original on 30 May 2010. Retrieved 19 May 2010. ^ Sobolewski, M.A. ; Langan & Felker, J.G. & B.S. (1997). "Electrical optimization of plasma-enhanced chemical vapor deposition chamber cleaning plasmas" (PDF). Journal of Vacuum Science and Technology B. 16 (1): 173–182. Bibcode:1998JVSTB..16..173S. doi:10.1116/1.589774. Archived from the original (PDF) on 18 January 2009. ^ Okumura, T. (2010). "Inductively Coupled Plasma Sources and Applications". Physics Research International. 2010: 1–14. doi:10.1155/2010/164249. ^ Plasma Chemistry. Cambridge University Press. 2008. p. 229. ISBN 9781139471732. Archived from the original on 2 February 2017. ^ Leroux, F.; Perwuelz, A.; Campagne, C.; Behary, N. (2006). "Atmospheric air-plasma treatments of polyester textile structures". Journal of Adhesion Science and Technology. 20 (9): 939–957. doi:10.1163/156856106777657788. ^ Leroux, F. D. R.; Campagne, C.; Perwuelz, A.; Gengembre, L. O. (2008). "Polypropylene film chemical and physical modifications by dielectric barrier discharge plasma treatment at atmospheric pressure". Journal of Colloid and Interface Science. 328 (2): 412–420. Bibcode:2008JCIS..328..412L. doi:10.1016/j.jcis.2008.09.062. PMID 18930244. ^ Laroussi, M. (1996). "Sterilization of contaminated matter with an atmospheric pressure plasma". IEEE Transactions on Plasma Science. 24 (3): 1188–1191. Bibcode:1996ITPS...24.1188L. doi:10.1109/27.533129. ^ Lu, X.; Naidis, G.V. ; Laroussi, M.; Ostrikov, K. (2014). "Guided ionization waves: Theory and experiments". Physics Reports. 540 (3): 123. Bibcode:2014PhR...540..123L. doi:10.1016/j.physrep.2014.02.006. ^ Park, J.; Henins, I.; Herrmann, H. W.; Selwyn, G. S.; Hicks, R. F. (2001). "Discharge phenomena of an atmospheric pressure radio-frequency capacitive plasma source". Journal of Applied Physics. 89 (1): 20. Bibcode:2001JAP....89...20P. doi:10.1063/1.1323753. ^ Plasma scattering of electromagnetic radiation : theory and measurement techniques. Froula, Dustin H. (1st ed., 2nd ed.). Burlington, MA: Academic Press/Elsevier. 2011. p. 273. ISBN 978-0080952031. OCLC 690642377. ^ "High-tech dentistry – "St Elmo's frier" – Using a plasma torch to clean your teeth". The Economist print edition. 17 June 2009. Archived from the original on 20 June 2009. Retrieved 7 September 2009.